Awesome, feel’s like I’ve been waiting forever for this. Wonder what kind of “odd” items Musk will put inside it? Yes, and it’s another stay-up-late launch. Cool idea about the hamster. The ISS folks would have a new pet and they could call the little guy ‘Zero G’. Wonder what kind of “odd” items Musk will put inside it? It’s an ISS flight, so every single item will have to be screened by NASA. They might treat it like an extra cargo flight though. I can be one of the dummies..
SpaceX already announced that it will carry a mannequin in a suit as part of the demonstration flight. True, but everything going to the ISS has to be cleared by NASA to be safe, which makes sense in terms of the ISS. Mannequin in a suit as well as cargo will be on board (according to what was reported at the NASA TV – SpaceX DM-1 Post Flight Readiness Review Press Conference). 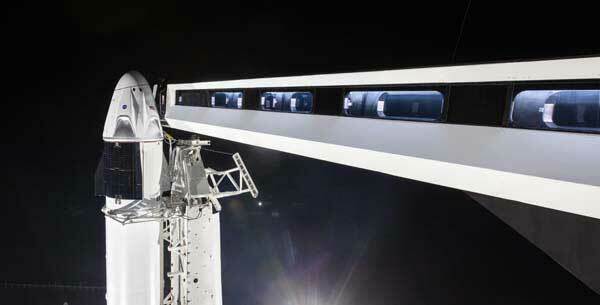 Go Dragon, Go Falcon, please pleas please everything work this year in the Commercial Crew program. Best of success to Space X, Boeing, and NASA. Quite. I think the degree of playfulness embodied by “Easter eggs” among the freight might serve as a good read on the degree to which friends or foes of SpaceX within NASA now have the upper hand anent CC. I’d like to think it’s the friends. Kathy Lueders was certainly in previously uncharacteristically feisty form at the post-readiness review press conference, while the usual purveyors of anti-SpaceX shade seemed more subdued. Well, to the good guys at NASA anyway. Maybe. But the last time it was cheese, the Dragon 1 carrying it didn’t dock at ISS. The SpaceX workers ate the cheese when it came back. Certain kinds of cheese are – how to put this nicely? – flatulence-inducing. Not sure one wants to send such a thing to a closed environment.